ESSO Notification is out. ESSO is recruiting for 02 Project Scientist Posts. 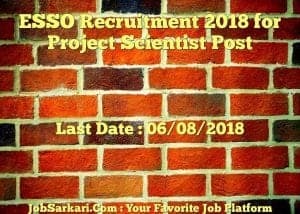 You can check ESSO - Earth System Science Organization last date, download ESSO notification, visit ESSO official website and check other ESSO Vacancy details.Complete Vacancy and recruitment Details about 02 Project Scientist vacancies in ESSO are provided below by JobSarkari.Com only for you. Project Assistant Candidate Must Have Passed M.Sc. in Atmospheric Science / Meteorology /Physics/Geophysics or Atmospheric Science / Meteorology / Physics /Geophysics Atmospheric Science / Meteorology / Physics / Geophysics or B.E./B. Tech in Environmental /Civil With 60% Marks and 04 Years Experience. 02. Max 35 Years as on 01/07/2018 (Upper age limit is relaxable by 5 years for SC/ST, 3 years for OBC, 10 years for physically handicapped persons and as per rule for ex-servicemen). 4.Upload the Scanned Copy of CV and Other Required Documents in Prescribed Size and Format. Q. What is the Last Date For ESSO Project Scientist Vacancy ? A. 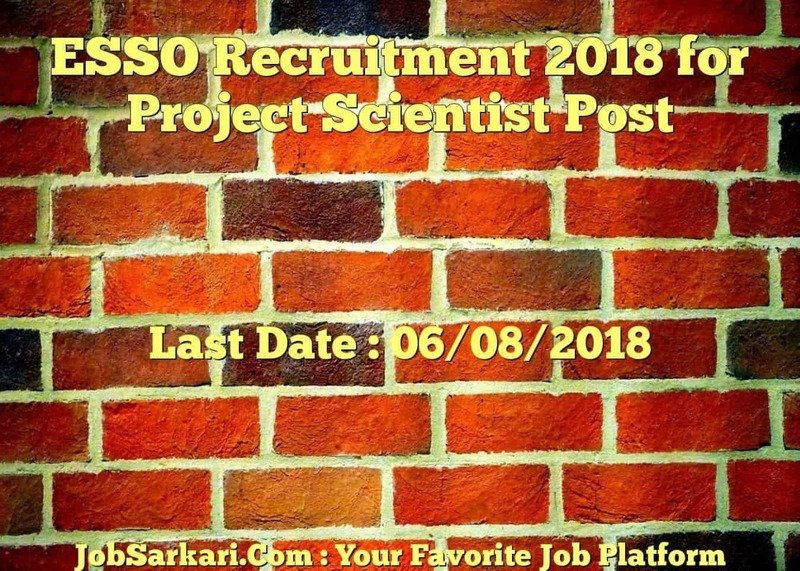 Last Date for ESSO Project Scientist Posts is 06/08/2018. Q. What is the Form Type of ESSO Project Scientist Recruitment ? A. The Form Type for ESSO Project Scientist Posts is Online. Q. How many vacancies are available in Earth System Science Organization Project Scientist Posts ? A. There are about 0 Vacancies in Earth System Science Organization Project Scientist Posts. Q. What is the Full Form of ESSO ? A. Full Form of ESSO is Earth System Science Organization .